Thank you for helping us write success stories! How do we define success at Foundation for Baltimore County Public Library? Well first, there’s the obvious way — contributions that we are so grateful for, because we know you make a conscious decision to donate based on your values and our mission. We can’t thank you enough for believing in us and trusting us to put your contributions to good use. More importantly, we also define success by the people who benefit from programs and projects we fund — programs and projects we can only fund with your help. Foundation for Baltimore County Public Library purchased four telescopes that customers can check out, take home and use to look at the sky with a new perspective. The branch also uses the telescopes for programs and has partnered with organizations such as the Space Telescope Institute and the Towson University Planetarium. 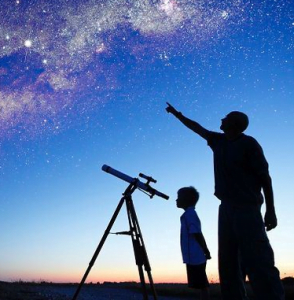 When asked why the branch staff applied for a Foundation grant to fund the purchase of telescopes, Nicole Wilson, a librarian at Catonsville Branch, said, “We wanted to inspire our customers to learn simply for the sake of learning. Learning is a habit: it often starts at a young age and, if nurtured over time, it can enrich a person’s life with each passing year. We could think of nothing that would inspire learning more than looking up at other worlds.” She added, “One mother told us that when she took one of our telescopes home, she was able to show her children the rings and moons of Saturn — and that it was ‘amazing!’ Because of the Foundation’s support, we have found new ways to amaze, astound, educate and inspire.” This inspirational program is only possible with the help of supporters like you! With the Foundation’s support, Reading Buddies pairs teen volunteers to read with younger children grades 1 through 3. Christina Miller, a librarian at the Parkville-Carney Branch, shared one mother’s testimonial about the effect the program had on her daughter, who attended the program because she struggled with reading. 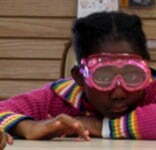 Recently, her daughter's teacher told the mother, "I don't know what you have been doing differently, but keep it up! Your daughter's ability and confidence in reading has improved drastically over the last couple of months!" The mother said, "Who would have thought that 45 minutes a week with a Reading Buddy would have such a great impact!" This success story is only possible with the help of supporters like you! Baltimore County Public Library became the first public library in the country to partner with the Clinton Foundation’s Too Small to Fail initiative when Foundation for Baltimore County Public Library fully funded the installation of Talking is Teaching signs at the Sollers Point Branch. "Talking is Teaching: Talk, Read, Sing" is a public awareness and action campaign from Too Small to Fail that helps parents recognize their power to boost their children’s early brain and vocabulary development through simple, everyday actions — like describing things while walking outside or singing songs together. 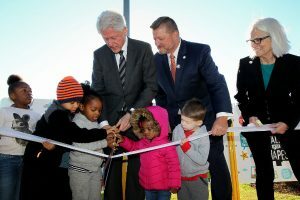 In October, we were honored to be joined by President Bill Clinton as we cut the ribbon to introduce the signs to the Sollers Point community. Foundation for Baltimore County Public Library has committed additional funds to install signs elsewhere in the county in the near future. This project — and this incredible partnership — are only possible with the help of supporters like you! As always — we can only do these things with your help. Be involved — please give to Foundation for Baltimore County Public Library today! Continue reading for some past success stories. Ms. Ortiz, a resident new to her community, noticed that a friend had a lot of urban fiction novels and asked to trade with her. Her friend told her they were library books and she should visit the Sollers Point Branch. When she visited the branch, Alysia, a Baltimore County Public Library staff member, assisted Ms. Ortiz by registering her for a library card, and then gave her a tour of the branch and pointed out all the services and materials available. The customer was absolutely thrilled when she saw the large selection, and she now visits her home library branch often. Lisa, a librarian at the Essex Branch, was approached by a customer seeking suggestions to help her 6-year-old son Thomas, who was struggling to read. Lisa shared with her the Dolch Sight Words list, offered suggestions for playing simple word games to engage her child at home, and recommended some Beginning Reader titles. 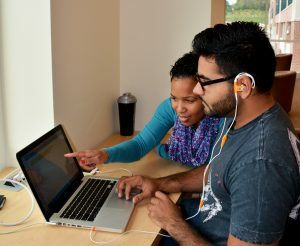 She also encouraged the customer to request a Playaway Launchpad title that focuses on basic sounds. The customer called a few weeks later to thank the librarian and was thrilled to report that Thomas is finally making great progress! A customer contacted our Woodlawn Branch in August to ask about financial literacy classes for children and preteens. None were offered at the time, but Jarrett, the program coordinator at Woodlawn, saw an opportunity and pursued it. The branch developed a program that will begin in January 2017. When the program coordinator called the customer to inform her, she was so impressed she wrote a letter saying, "Usually when I provide feedback at other agencies/companies, I do not hear back from the company. Thank you so much for being such a great community partner and service provider. Thanks for making learning fun. Thanks for thinking outside the box. Thanks for being creative. Thanks for being attentive and modern. Thanks for everything! I am impressed!" Mr. Jones called the Cockeysville Branch to renew a DVD and, while he was on the phone, he told Lou, the circulation manager, how friendly and helpful he found the staff. He said he’d been home for three months recovering from a heart attack, and he really appreciated being able to use the library's resources to occupy his time off, especially the downloadable material since he didn't even need to leave his house to access it. Our Storyville location at the Rosedale Branch hosts monthly Learning Parties, where parents can explore different ways to improve their young child’s learning skills through play. One family attended every single party for three years before the child aged out of the sessions. Jess, the Rosedale Storyville coordinator, saw the family while running errands and asked how the child was doing in kindergarten. The mother said that the boy was excelling and was clearly advanced compared to the rest of his class. She said that the Learning Parties informed many of the decisions she made as a parent, and helped to guide her son’s development. She was grateful to have had that experience with her child at Baltimore County Public Library. At one Makerspace Monday event at the Rosedale Branch, the participants were mostly girls. The activity involved using Silly Putty and other “gooey” materials. One girl said she didn’t want to participate because she “didn’t like gooey stuff.” After watching the others dig in and have fun, she gave stirring the Silly Putty by hand a try. It was like a lightbulb went off in her head, that there was no reason she shouldn’t like “gross” things, and she started creating with the materials at hand. This is why makerspace is important — to introduce children to things they might not have access to or otherwise engage with. 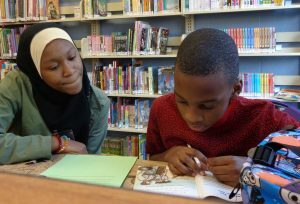 A school-aged brother and sister approached Randallstown Branch librarian Lori and asked for a superhero book. The boy started to describe it and, as they were walking to the children’s section, the sister started asking about other titles too. Although Lori didn’t recognize the kids, they were both adamant that she'd told them about the books. After a little more chatting, Lori realized they were part of an elementary school Summer Reading Club session that she'd attended on behalf of Baltimore County Public Library. Lori read several books and, three months later, the kids came to the library for them! Lisa Z., a librarian at Essex Branch, was approached by a customer seeking suggestions to help her 6-year-old son, who was struggling to read. Lisa printed out the Sight Words list, offered suggestions to play simple word games to engage her child at home and recommended some beginning reader titles. Lisa also encouraged the customer to request a Launchpad title that focuses on basic sounds. The customer called recently to thank Lisa, and was thrilled to report that her child is finally making great progress! In January, the Rosedale Branch provided a Social Media Primer where customers learned more about current tech trends such as SnapChat, Vine, Instagram and Facebook. A retired gentlemen was very excited to discover he could reconnect with high school classmates in his home town in South Carolina. He had some computer experience at work but was completely new to using them for fun. He plans to follow up with a My Librarian appointment to set up his first Facebook page. Learning the different levels of controlled privacy helped put his fears of technology at ease. He was delighted by the free assistance the library offers on a daily basis and is excited to attend more classes. Speaking of My Librarian, Sarah Jane, a librarian at Rosedale Branch, recently had an appointment with a veteran in his 70s who wanted to learn how to use his brand new tablet. At the appointment, he learned about apps and how to use Google maps to locate the small German town where he was stationed 50 years ago. He was able to successfully manipulate the screen to zoom in and discover that there’s now a McDonald's. He left happy with this new skill which empowered him to remember and investigate his past. That was how he was planning on spending the rest of his evening.